Ulixis Crafts: Item of the day! I haven't featured a shop in a long time, mostly because I've been neglecting my blog. So today I'm going to show you a few sizzling hot favourites of mine by sarahminshall. 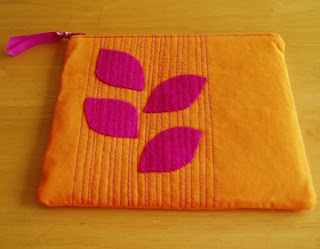 This bright orange pouch features leave in hot pink to make a great colour combination for summer. The lines of sewing just add to its charm. 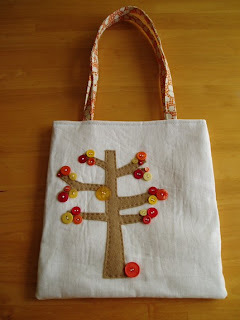 Now that pouch would go nicely in this pretty warm button tree tote bag. Anyone who's glanced through my shop knows I love buttons, and I just love this warm colour combination. The pattern of the lining fabric is also gorgeous and complementary. 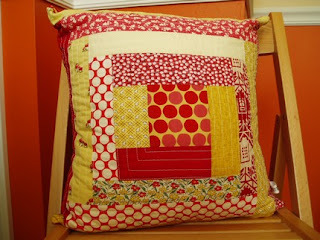 Speaking of bright orange, red and yellow... this spark pillow is sure to inject some fun into any room! I love the polka dots, flowers and little red mushrooms. Make sure to take a look at all the pictures in the listing ~ you can see that the back is solid red with a sweet yellow ribbon bow.